LEN - www.lankaenews.com | President’s wheeler dealer son in law was also around in same hotel when bribe passed ; DG of Bribery Commission at receiving end of president’s filthy abuse ! 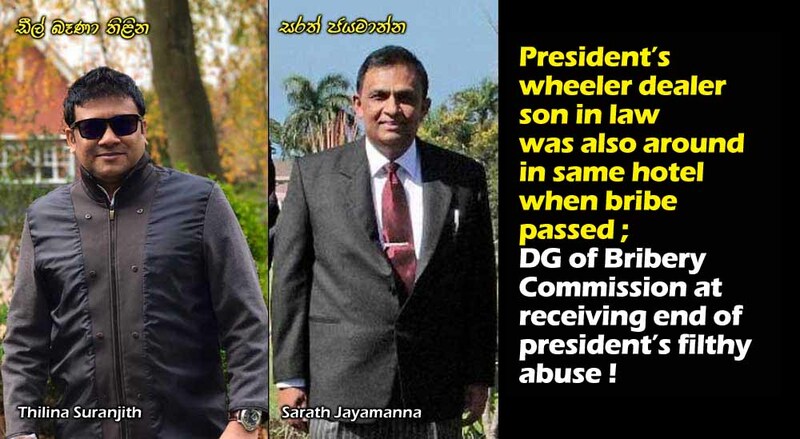 President’s wheeler dealer son in law was also around in same hotel when bribe passed ; DG of Bribery Commission at receiving end of president’s filthy abuse ! (Lanka-e-News - 08.May.2018, 11.30PM) It has now come to light that the notorious wheeler dealer son in law of president Gamarala had been a short distance away in the same hotel when the bribery commission officials nabbed Mahanama the chief of staff of the president and Dissanayake , the chairman of State Timber Corporation (a very close friend of Gamarala’s family ). Soon after the arrest , Gamarala has summoned the Director General of the Bribery Commission and abused him in foul language , based on reports reaching Lanka e news inside information division. It is when the sum of Rs. 20 million was being received as advance of the full sum of Rs 100 million demanded (Originally Rs. 540 million had been demanded as the bribe which had been reduced by negotiation to Rs. 100 million), the two culprits – the most close cronies of the president were arrested. Thilina Suranjith the wheeler dealer son in law has been at another location in the same hotel Taj Samudra earnestly waiting to collect the Rs. 20 million to be handed over to him after the two bribe takers have received the bribe from the Indian national. Two bosom pals of Thilina had also been with him, but the latter who is an accomplice after learning that his two criminal bribe takers have been nabbed , Thilina had fled the scene . It was a PSD officer who was with Thilina had told the chief of the PSD to inform the president of this misfired bribe taking deal. Thilina the wheeler dealer son in law of Gamarala is the one who had negotiated and brought down the amount to Rs. 100 million as the bribe to be paid by the Indian national , and Thilina himself has chosen Singapore to collect this bribe, based on reports. However as only Rs. 20 million was agreed to be paid as advance , Singapore was forgotten and Colombo was remembered. Therefore Taj Samudra Hotel was chosen for this collection. It is learnt most of the illicit deals of Thilina are transacted in Taj Samudra , and that is his home away from home. Based on the experience of the Bribery officials , when massive bribes are being collected , those payments are not made in installments usually. But in this instance , because for Gamarala and his son in law , bribe taking is a matter of routine like eating rice several times , this arrangement had been made. Arrest of Wheeler dealer Son in law obstructed; President in a fit of rage scolds DG of Bribery Commission ! The involvement of Thilina in this deal is testified to by evidence including his conversations via phone and taped recordings , but as urgent and massive moves are ahead to suppress this on the initiative of Gamarala , and his intervention , Thilina who should have been arrested by now is being protected. President who summoned the DG of the Bribery commission after the incident has abused him in the choicest language. President who started cordially with the words ‘Mr. Jayamanne’ had then launched into a tirade : ‘Oiy , even after I gave you an extension you have slung mud at me which cannot be washed away’ , the president had berated. It is well to recall Lanka e news in an earlier report revealed , though the Bribery Commission Director General Jayamanne ought to function impartially , sadly , instead he prefers to spend all his time at Paget Road residence of the president . We also exposed that because Jayamanne is doing all the sordid biddings of Gamarala , he is going to be given an extension in service. On the day the raid was conducted Jayamanne had been in the Attorney General’s department . The officers who raided having known about Jayamanne’s traits and ways had informed him about the raid only a little while before , and have not told him which raid was going to be conducted. While the president was viciously abusing him , Jayamanne has pleaded with him and explained he did not know it , Gamarala’s mad rage has turned even worse then ,’if that is so , you resign and go’, Gamarala had thundered. Following the insolent and foul language used to berate the DG , Jayamanne unable to swallow the gall of indignity any more is trying to secure a post in the UN Organization. With this turn of events , the legal action to be taken against president’s son in law and other accomplices had been suspended. Shameless secretaries whitewash the reputation of President while civil organization leaders feign death ! A news website belonging to a media secretary of a senior minister which is in fact a lie factory is concocting all the lies on earth in an attempt to whitewash the reputation of Gamarala which is now in tatters. One of the lies was , the Bribery Commission had informed the president about this raid 3 years ago. It is to be noted ,3 years ago , the Director General of the Commission was Ms. Dilrukshi Dias Wickremesinghe , the iron lady who took no instructions from the president , P.M. , ministers or M.P.s , when performing her duties duly . She took action against the culprits irrespective of their ranks and status independently and impartially . This is why she became a thorn in the side of the president who has always displayed he has a great affinity for the crooks and crookedness . The whole country is aware she had to resign from that position because corruption tainted president Gamarala could not endure her honesty , integrity and rectitude. It is a matter for surprise , the so called leaders of civil organizations are deaf ,dumb and blind amidst the outrageous bribery scandal involving the president and his son in law , without raising their voice or vociferously protesting against this. It is only in these critical situations , the true colors and chameleon characteristics of some of those cardboard leaders of civil organizations who gourmandize during night at Paget Road , and protest during day carrying boards become manifest. * Two culprits “President’s men” who collected huge bribes remanded ; isolated instance of corruption detected , but how many others are going undetected ? * President Gamarala‘s Rs. 540 million bribe taking..! His chief of staff and timber Corp. chairman collect Rs. 20 million as down payment -caught red handed !! * Mahanama president’s chief of staff nabbed when receiving a bribe of Rs 20 million!